Nothing new here. I just need to post this chart because I keep looking for it for reference. My main takeaway is that the US spends a much higher proportion of its health care dollars privately than do almost all other OECD nations. 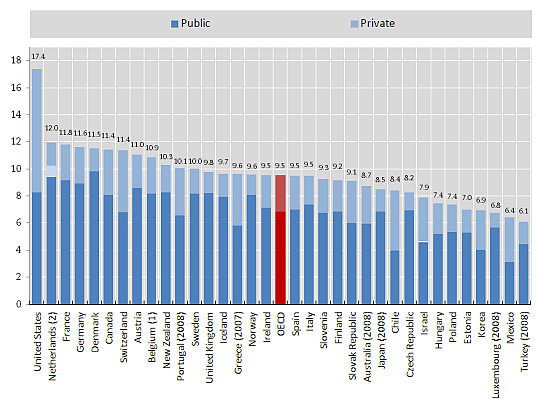 It looks like only Chile and Mexico may have a nearly equivalent public-to-private ratio as the US. It shows that we pay more than any other health-care system and, to add insult to injury, have ended up with more government than most of our competitors, too. It’s the worst of both worlds: a government-run health-care sector that is larger than the international norm, a private health-care sector that’s vastly larger than anything else out there and vast inefficiencies caused by the overlap and poor coordination between the two. Not sure what Ezra was counting as “government run” health care but the only government run health care I am aware of is the Veterans Administration and possibly a few public health clinics here and there. These together are a very small percentage of our health care system. If he was thinking of Medicare and Medicaid, they do pay for a lot of health care but to say they “run” it is quite a stretch… our free for all private sector really runs most health care in the US and should take blame or credit for failures and successes. If you do look at the public expenditures alone on health care and put these into an efficient system such as those in France, Germany, Canada, etc., we could fund all health care in the US and enjoy their better outcomes with a much smaller private cost. IMO if we do go to something like single payer the goal should be to cover everyone for less than the Government spends now.